24 Thoughts: A Toronto FC state of the union, a welcome to FC Cincinnati – and a new tournament for the Americas? Major League Soccer’s 24th season kicks off on Saturday, and to celebrate the return of the top soccer circuit in the United States and Canada, Yahoo Sports’ weekly MLS column is back, too. A lot has happened since Atlanta United hoisted MLS Cup back in December. There are so many places we could start. But given that this space is now called 24 Thoughts as a nod to the number of teams now in the league, expansion FC Cincinnati seems like the obvious jumping off point. FCC makes its MLS debut on Saturday night in Seattle [10 p.m. ET, FS1]. That’s a tough place to start. Cincinnati is still looking for attacking reinforcements after failing to lure Matias Fernandez from Necaxa last month, but some help could be on the way soon. Goal.com reported this week that U.S men’s national team winger Kenny Saief is in the process of swapping Belgian side Anderlecht for MLS. I’m told Cincy is the frontrunner to sign Saief. 1. FCC, which has already sold more than 20,000 season tickets for its inaugural campaign, has been criticized for its roster construction. The Orange and Blue won just one of four preseason games against league teams. But they do have a ton of MLS experience in the back in former Vancouver Whitecap Kendall Waston, fellow center back Nick Hagglund (Toronto), left back Greg Garza (Atlanta) and right back Alvas Powell (Portland). 2. Hagglund was acquired from TFC for $300,000. That’s a lot of money in MLS, but FCC enticed the Cincinnati native to come home. “We freely admit that we overpaid for him,” the club’s VP of communications Lizz Summers told Yahoo Sports. (It’s great to have Lizz, who worked for the Revs for years before taking a job at Boston College, back in the league.) Hagglund’s Cincy roots run deep. His wife is from the city. The 26-year-old even stayed local for college, playing four years at Xavier University. 3. “I didn’t have many options,” Hagglund laughed when we spoke last week. “It just so happened that Xavier was interested.” Hagglund grew up supporting Ohio’s original MLS team, the Columbus Crew. He even played for Columbus’ U-19 and U-20 teams, making the nearly two-hour trip from Cincinnati to the Crew’s training facility in Obetz. His dream was to make it to MLS. Playing in his hometown never crossed his mind. 5. FCC boss Alan Koch is one of just three expansion coaches to make the jump from the second tier. Koch, a native of South Africa, joins Teitur Thordarson (Vancouver, 2011) and current Minnesota United manager Adrian Heath (Orlando). Heath lasted one full season. Thordarson was out after only 12 matches. Here’s hoping Koch survives longer than both. 7. If it happens, dos Santos’ departure would come on the heels of Ola Kamara’s transfer to China, leaving the five-time MLS Cup champions without a proven second forward behind Zlatan Ibrahimovic. It might be good news for youngster Efrian Alvarez, though. 8. In years past, the dos Santos situation might have gone another way. The league might have been tempted to break its own rules to accommodate a marquee player. It’s happened before. It’s a sign of progress that MLS HQ put its foot down in this case, as I understand occurred here. They made it clear that to L.A. that they would not be allowed to keep four DPs. The league office still meddles in player personnel issues more than is necessary at this stage of MLS’s existence, but they got this one bang-on. 9. 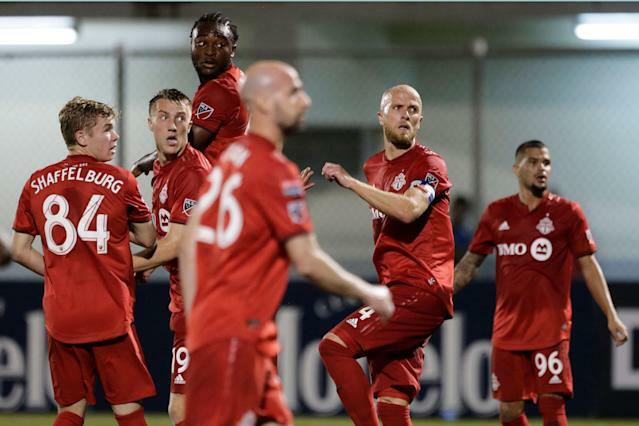 TFC has been getting dunked on plenty over the last week, and for good reason. The Reds, who eliminated Mexican titans Tigres and Club America before losing the 2018 CONCACAF Champions League final on penalties to Chivas Guadalajara, were embarrassed in the 2019 event, losing 5-1 on aggregate to Panamanian minnow Independiente. The lopsided defeat highlighted the gaping hole that Sebastian Giovinco’s departure left in Greg Vanney’s lineup, at least until Spanish midfielder Alejandro Pozuelo arrives next month. 10. I understand the Toronto fans who are still upset about losing Giovinco. The tiny Italian helped turn TFC from a laughingstock that had never made the playoffs into the MLS champion in 2017. He might be the best player this league has ever seen. I also get why the Reds sold him to Saudi club Al-Hilal. 11. From what I’m told, the offer the 32-year-old received from Al-Hilal was for three years, $30 million, net. That’s more than twice as much as Giovinco took home after taxes in Canada on his $7.1 million 2018 salary which, by the way, was the second-richest in league history. 12. TFC president Bill Manning told Sportsnet that Giovinco wasn’t willing to take a pay cut. The club could’ve allowed him to play out the final year of his deal but didn’t want to risk keeping an unhappy player. A new contract had long been on Giovinco’s mind. Even with almost two full years remaining on his deal, he was publicly lobbying for an extension on the eve of that CONCACFAF final in Guadalajara. 13. 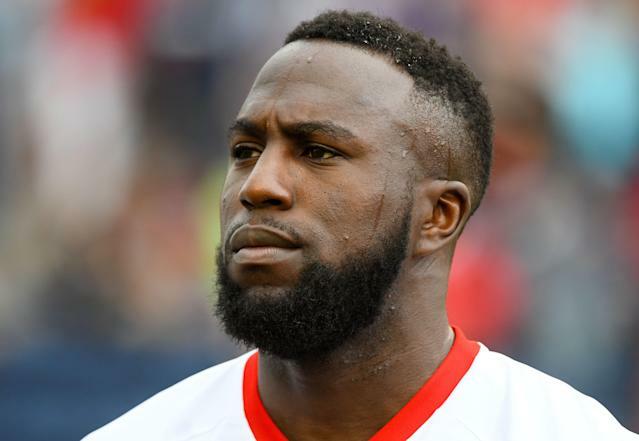 The departure of Giovinco and fellow attacker Victor Vasquez definitely made it more likely that Jozy Altidore would reup. The 29-year-old made it official on Thursday, inking a contract that will take him through 2022. 15. “Like anything else in life, it came down to timing,” agent Lyle Yorks told Yahoo, adding that Altidore had offers from Europe and beyond. “Things really picked up over the last two three weeks.” Yorks wouldn’t comment on the numbers, but my understanding is that Altidore, who has 60 goals and 20 assists in 114 games for TFC, will average a bit less than the $5 million per he commanded upon his arrival from Sunderland in 2015, probably somewhere around the $3.5 million range on a guaranteed, front-loaded deal. 16. Earlier this week, the New York Times reported that U.S. Soccer president Carlos Cordeiro had invited the 10 South American federations to a proposed 16-team stateside tournament next summer that would look a lot like the smash-hit 2016 Copa America Centenario. Here’s some additional detail on that. 17. Back in January, a well-placed source told me that the idea of another combined tournament was “DOA.” But it makes sense that the USSF wants to find a way to make it work. From a competitive point of view and a financial one, it’s a no-brainer. 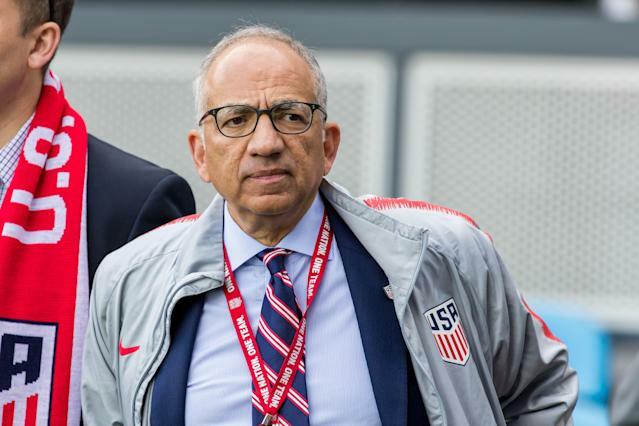 And even if CONMEBOL doesn’t like U.S. Soccer soliciting its member associations directly, the hope within the federation is probably that it might pressure South America’s governing body to re-consider helping organize a combined tourney with CONCACAF. 18. When the news broke, I wondered how the federation could be sure that clubs would make their top players available. After all, this wouldn’t be a continental competition. It’s not on the FIFA calendar. (There’s currently only a 10-day fixture window for teams not competing in the 2020 European Championship.) On the other hand, I doubt that Cordeiro would have taken this extraordinary step before first gaining the approval of FIFA president Gianni Infantino. 19. What does this have to do with MLS, you ask? Plenty. I’m not sure Tata Martino ends up as Atlanta United’s first manager without spending June of 2016 hopping around the U.S. with Argentina’s national team. Multi-purpose MLS stadiums in Atlanta, New England and Seattle would almost certainly host games. And the league would be able to showcase its growing number of all-world training grounds – more than $300 million has been spent on such facilities just in the three years since the Centenario – to some of the best players on the planet. 20. Cordeiro stressed in his letter that the proposed tourney would be a one-off. If it happens, though, it’s not hard to see another edition scheduled for 2024 as a dry run for the Canada, Mexico and U.S.-hosted World Cup two years later. With the elimination of the Confederations Cup, there’s room for another permanent international competition on the FIFA calendar. You can be sure that U.S. Soccer sees the opportunity. 21. Time will tell how Frank de Boer does in Atlanta, but a couple of things stick out already. In his introductory press conference, De Boer admitted that he didn’t know much about MLS before taking the job. That’s a far cry from Martino, who had compiled a dossier on every team in the league before he was even interviewed. I’m also not sure how logical it is for De Boer to fix what isn’t broken by shifting United to an unfamiliar 3-4-3 formation. 22. I’m also fascinated to see how Guillermo Barros Schelotto fares in his first season at the Galaxy’s helm. The early word out of LA is that the Argentine doesn’t devote a ton of time to talking to his players. That’s not at all unusual in Europe and South America, but it’s practically unheard of in MLS. 23. How is it that CONCACAF’s under-17 World Cup qualifying tournament begins on May 2, and the U.S. U-17s still don’t have a head coach? 24. I’d be remiss not to mention Sigi Schmid and Fernando Clavijo, American soccer trail blazers and former MLS coaches who passed away during the offseason. I didn’t know either man well, but spoke to both on many occasions. Clavijo coached in the very first MLS game I covered way back in 2002, the season opener between his Revolution and the MetroStars. His team lost that day. He was clearly devastated. But he couldn’t have been kinder to a nervous young reporter. MLS was in a different place then, a 10-team league that had shuttered two clubs a few months earlier. Clavijo understood how important it was to always be an ambassador of the sport. Same goes for Schmid. I sat down with for a long, off-the-record chat about all things American soccer with the then-Galaxy boss as recently as last summer. The conversation lasted about 40 minutes, but I could’ve picked his brain for hours. Sigi’s passion for the sport was obvious, as was his unwavering belief in domestic players and coaches. Rest easy, gentlemen.